Trisha over at Yellow, Green and Read All Over nominated me for this fun challenge. Thanks and be sure to check her blog out! 3. Nominate 3 bloggers each day to continue the challenge. My last quote was difficult to decide on. I have so many quotes that I love from many different books and authors. But one of the first authors I ever read and enjoyed immensely was Dr. Seuss. I grew up with his books and their quirky words and rhyming stories that were always so easy to get wrapped up in. So for my final quote I choose a quote from my favorite Dr. Seuss story, The Lorax. 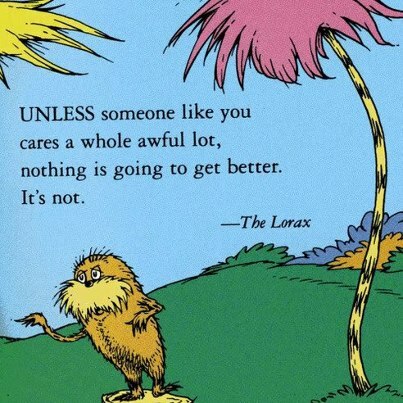 The Lorax is by far my favorite of all of Dr. Seuss’s books. I love the characters and the story resonates with me to this day. I chose this quote because it is simple and easy to comprehend and understand. As a society we always are bemoaning some issue. Whether on the news, Twitter, Facebook or the plethora of other sties and outlets, we hear constantly about different problems that need to be solved or rectified. This quote says it all. If there is something we feel profoundly strong about. If there is one issue that bugs us day in and day out, we are the ones who can solve it. Once you care, you can do so much. Caring gives you the drive to push forward and try to find a way to enact change or solve the problem. The first step is caring and then showing the world why you care and then fighting because of how much we care. Nomination time – If you have done this challenge or if it does not fit your interests, no worries no need to take part. Posted on November 2, 2015, in Writer's Perspective and tagged 3 Quotes 3 Days Challenge, challenge, Dr Seuss, fiction, quote, The Lorax. Bookmark the permalink. 2 Comments. Your welcome for the nod and yeah I would understand not being able to do it for a third time. I had a difficult enough time deciding just for this once, not sure I could decide even twice!. I really appreciate the nod, but I have done this one twice. I may still play, but I’ll have to think about it. (My well of quotes is getting shallow.) Thanks for thinking of me.